Florida Keys rainfall is quite easy to predict when it is going to fall. You see the islands have two seasons, wet and dry. Oh yeah, one more thing, the weather for Florida means from November through to April the sun shines almost all the time. 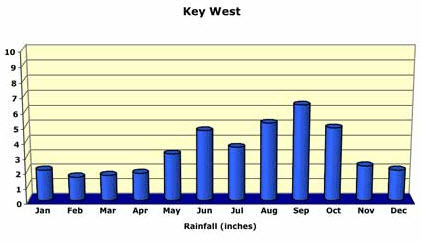 During these months only a quarter of the Florida Keys rain occurs, and this is normally linked to a cold front which sometimes happens in the middle of winter. The rest of the rain occurs from May to October. This is the rainy season, when the other three quarters of our annual rainfall occurs. Most of the time the rain is just a brief daily downpour, which by relaxing in one of the many island bars with a nice cool drink, you can escape Florida Keys rainfall with a nice Rum Runner, or even better the weather themed Hurricane Drink. And do you need an excuse to sit in a bar......come on?? 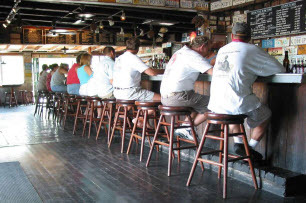 However, you really won't be spending all your time sitting in the bars on Duval Street and other Key West drinking establishments unfortunately, as the figures are a bit deceiving. Our climate is very dry indeed. The average rainfall in the winter is less than 2 inches a month. The summer months you might see closer to 4 to 5 inches of rain. So you can probably forget about packing the umbrella on this trip. Unless its to protect you from the sunshine!